WHEN Dundalk won the AIG Barton Shield Leinster title at Mount Wolseley four weeks ago, a massive weight was lifted off the shoulders of Aaron Grant. The 31-year-old had endured many years of heartache in the quest to be part of a successful senior team but the smile on his face when Dundalk sealed their win over Enniscorthy in the provincial final said it all. Having waited a long time to get his hands on one blue Leinster pennant, Grant now finds himself heading to Mount Juliet this weekend with his senior panel team-mates hoping to land a second when Dundalk and seven other clubs tee it up in Leinster Finals of the AIG Senior Cup. The Senior Cup is the Holy Grail of inter-club golf club in Ireland and was first played for in 1900, five years before Dundalk Golf Club was founded. Having achieved the objective of landing a first ever senior club title last month, Grant and his team-mates are now keen to do the double. “I believe you have got to take your chance when it comes along. We don’t know what is going to happen next year so this is a great opportunity for us and we will be doing our best to take it,” said Grant. 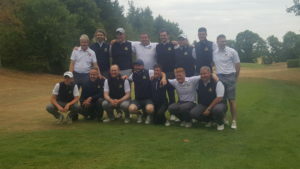 Dundalk qualified for the Leinster Finals after three impressive wins over Killeen Castle, Headfort and Co Louth in the regional qualifying round of the Senior Cup at Laytown & Bettystown last June. The Dundalk squad spent the weekend in Mount Juliet preparing for the Leinster finals and according to Grant nothing is being left to chance. One of the features of the Barton Shield Leinster Finals was the large crowd from Dundalk who made their way to Tullow and a big contingent is expected to travel to Mount Juliet on Saturday to support the team in their Leinster quarter-final against The Island. The match against The Island will tee off at 8am on Saturday morning and the format is five players playing singles matchplay off scratch. Dundalk managers Alan McCabe and John Conlon will select from an eight strong panel, every one of whom is showing good form at the moment. “Since the Barton Shield win they have all been focused on securing one of the five places on the team to face The Island on Saturday and they have certainly given us plenty to think about. We’ll have a few tough calls to make but that’s the way we want it, everybody pushing hard for selection.” said Conlon. If Dundalk get through, they will face the winners of the quarter-final between Dun Laoghaire and Tullamore at 2pm on Saturday. Old Conna, Portmarnock, Carton House and Enniscorthy are in the bottom half of the draw and the final is scheduled for Sunday morning at 10am. Having battled alongside the likes of Peter Rogers, Declan Toal and Simon Waters for many years trying to make a breakthrough, Grant admits he is exciting by the potential of the current senior panel which includes the likes of newly crowned South of Ireland champion Caolan Rafferty, Boys internationals Eoin Murphy and Josh Mackin, Brendan Lawlor who is currently ranked second on the European Disabled Golfers Association Tour, as well as Conor Curran, Neal MacKell and Andrew Keenan. Little wonder that Grant is walking around with a spring in step and finally realising a dream that was first ignited many years ago when he watched his neighbour Justin McArdle hitting golf balls from the Sean O’Mahony’s pitch on the Point Road and trying to land them in the centre circle of Clancy Park. 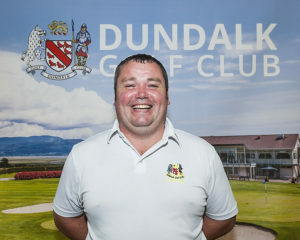 “Justin was a big inspiration to me and I am lucky that I always got wonderful encouragement and support from my parents, my wife, Maria, and my children while others, like Terry Sloane, helped me in the early days to get to play in the boys and youths championships and events like the Mullingar Scratch Cup,” recalled Grant who famously beat a certain Rory McIllroy in 2004 at the Connacht Boys Championship in Portumna. Grant has been a man on a mission ever since then and this weekend is merely the next chapter in what he hopes will be a year to remember for Dundalk Golf Club. Dundalk Senior Panel: Conor Curran, Aaron Grant, Andrew Keenan, Brendan Lawlor, Neal MacKell, Josh Mackin, Eoin Murphy, Caolan Rafferty. Managers: Alan McCabe and John Conlon.